Includes a Sip Lid, Storage Lid, and a Replacement Snack Lid. This is the perfect companion to the Snack-Trap. Get the most out of your Snack Trap with this convenient three-pack of lids. This set includes an extra snacking lid, a sip lid, and a snap over, stay fresh lid. The sip lid easily screws into the snack trap to instantly convert it into a sippy cup. The snap over/stay fresh lid allows you to save unused snacks and keep them fresh and secure. It snaps on to create a secure air tight seal. Store your toddlers snack or drink in the fridge without worrying about it spilling. This package also includes an extra snacking lid so you can wash one while the other is in use. Get the ultimate in versatility with this three piece accessory set. This is a "must have" for traveling or families on the go. Made from rugged plastic. Snack Trap sold separately. No more spilled Cheerios® or Goldfish® crackers! The Snack Trap Toddler Snack Cup is great for active toddlers. Our spill-proof Snack-Trap (sold separately) is so popular, we added an accessories pack! The Snack Trap is such a simple and useful invention, you will wonder how you ever got along without it. It’s a 7oz plastic bowl with handles on either side. It’s shaped more like a cup with a deep bottom, as opposed to a wide opening like a true bowl. On the top, a soft, split lid fits over the edges of the bowl. The lid is split into six pie-cut flaps to allow fingers to push down, gain access to the treats in the bowl and pull out a few at a time. With this great accessory pack, your snack trap will be more useful than ever. You will be able to store unused snacks or instantly convert it into a sip cup. This is the most safe and useful snacking solution available. Order Yours Today! Snack Trap Accessory Pack - The perfect no spill snacking solution. Give your children the independence of feeding themselves. 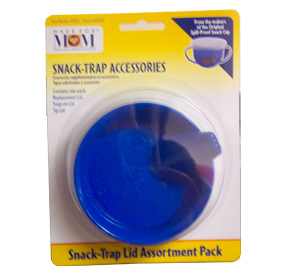 This great accessory pack will help you to get the most out of your snack trap. Order Yours Today! A Fun Way to Learn About Math & Measurements. Magnetic Building Blocks With A Fun Crescent Shape. 26 Piece Set. Playground Edition with 81 Pieces. Large Interlocking Blocks With Battery Powered Gears. Design and create on smooth an shiny surfaces. Reusable suction pieces act like pixels to create anything you can imagine. A classic style fidget toy with multi-colored lights on each arm. Stack, fill, float and pour. A 4 piece set for children of all ages.